Did you know that there are 61 different names for sugar? People are used to learning about food products, whether heavily processed or not, containing completely unfamiliar ingredients. “With our current food industry the way it is, I’ve come to expect it and have learned to become an avid label and ingredient list reader,” Sadie Wells, RD, LDN, CPT, says. But the nutrition facts label provides only a small fraction of information. You really have to read the actual ingredients to know exactly what is in the food or product. Most names for sugar will be listed as some kind of “sugar,” “syrup,” or end in “–ose,” there are some less common terms such as molasses, barley malt, and maltodextrin that we don’t tend to associate with sugars/sweeteners, Wells says. Other names include rice syrup, apple or grape juice concentrate, invert sugars, evaporated corn sweetener, sugar cane juice, fruit nectar, according to Susan Engle, MOE, RDN, LD, CLT, says. Added sugars are added to the food or product as ingredients, which means they don’t naturally occur in the food. “For example, a 5.3 ounce serving of plain yogurt has approximately 10 grams of naturally occurring milk sugar (lactose), whereas the same serving of flavored yogurt has approximately 22 grams of sugar,” Wells says. Therefore, an additional 12 grams of sugar was “added” to the yogurt. Some ingredients that contain sugar are honey, molasses, concentrates (think fruit juices), Wells says. “Probably the most widely used food additive is maltodextrin, a derivative from corn or sometimes wheat.” It is commonly used in sodas and candy, beer, light peanut butter, and can be used as a thickener in infant formulas or as filler in a variety of other products, she adds. 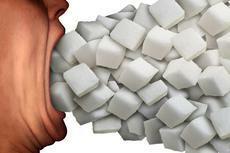 How much sugar is too much is based on individual basis. People have various caloric requirements, and the carbohydrate and sugar content, to some degree, will vary based upon their own requirements, health or exercise goals, Wells says. “There is no doubt that Americans do eat too much sugar,” Engle says. The average person consumes about 19.5 teaspoons (78 grams) of sugar per day, which is about 2-3 times the suggested amount, Wells adds. The American Heart Association advises a limit of 6 teaspoons (24 grams) for women and 9 teaspoons (36 grams) for men from added sugars. Based upon these guidelines, Wells recommends limiting added sugars to 8 or 12 grams for women and men, respectively, per meal.